Like Richard Linklater'sWaking Life andA Scanner Darkly, this film was hand animated frame-by-frame from live-action footage, although in this case it was done by some 100 artists working with oil paints. A look into the final days of Vincent van Gogh, the exquisitely rendered imagery is a swirling odyssey through his work, echoing characters and settings while exploring his tragic and mysterious death at age 37 in 1890. 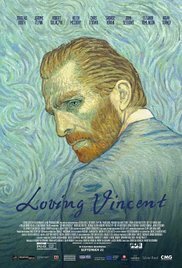 The story starts in 1891, as Armand is asked by his postmaster father to deliver a lost letter from Vincent to his brother Theo. So Armand sets off to Arles, where Vincent died, discovering that Theo died soon after. Armand speaks to locals including an innkeeper, boatman, artist, doctor and policeman. Most important are the daughter and housekeeper of Doctor Gachet, who treated Vincent. Each of these people has a specific perspective on Vincent's death, and Armand struggles to find the truth. The plot unfolds slowly, like a talky investigative mystery as Armand speaks to people who knew Vincent. Each of these accounts is accompanied with a gorgeous black and white flashback that beautifully traces Vincent's life and work. All of the imagery is breathtakingly inventive, dissolving from scene to scene in creative ways while placing clever references everywhere. And the backgrounds are witty recreations of Van Gogh's distinctive style. The approach allows the actors' performances to come right through into the animation. Each is recognisable in his or her role, bringing humour and emotion. Booth is in virtually every scene, a straightforward character whose curiosity is easy to identify with. Others basically get their one proper moment to shine as they recount their piece of the puzzle. Standouts include Ronan and Flynn, who add some extra internal oomph to their scenes. But of course the real stars here are the mainly Polish artists who worked so hard to create this film. It may be a bit dull and earnest in its approach, hinting at but never embracing the story's bawdier elements. But every scene looks so drop-dead gorgeous that we never want the movie to end. Especially since there are so many Easter eggs hidden in each scene. And because this is ultimately such a moving portrait of an artist who only painted for eight years, and never knew how profoundly he changed the world.